When “The World” wanted to know about global drought conditions last week, producers from one of the important news programs on National Public Radio called Circle of Blue. 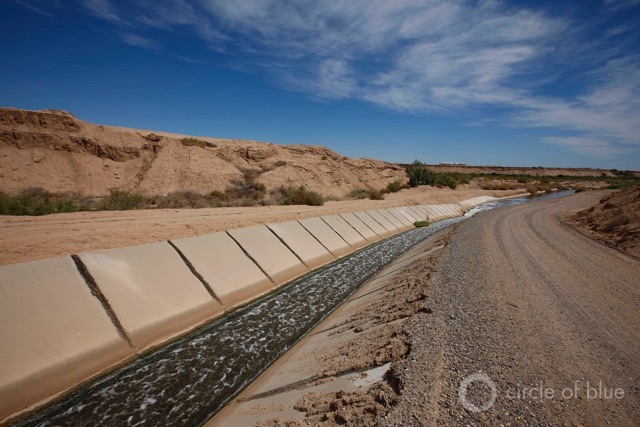 In a wide ranging conversation with the show’s host, Marco Werman, we described Circle of Blue’s findings on drought from our frontline reporting in Australia, Brazil, China, and California. Listen to the segment below or click here for the full story on PRI. California’s Imperial Valley is a desert region that uses three quarters of California’s allocated river water, moving to farm field through canals like these. Click image to enlarge. Time Global Health Summit: Hope?